Even though Krispy Kreme’s invasion of the UK is well underway with about 40 proper stores – and a number of Tesco supermarkets also stocking their products – it’s all down South still. There’s just four stores North of Oxford. So today we drove to Manchester to buy donuts. Well, it is my birthday. I know for a fact I didn’t ask for the two chocolate ring donuts, I think we missed out on glazed lemon filled at the expense of those, but it doesn’t really matter. They’re all good. 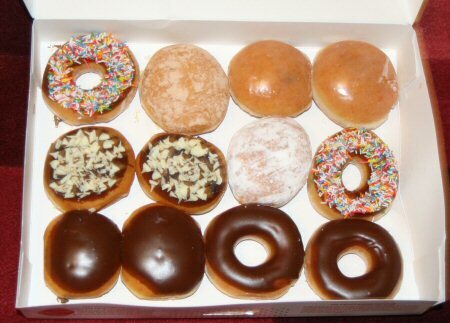 I’ve learned that the Krispy Kreme at Trafford Park is open as a drive thru until 2am some nights, and they bake fresh until 11pm every day. This is the actual definition of temptation. The question of whether a 90-mile round trip is far enough to put me off returning without any other reason for being in Manchester has yet to be answered. A month ago, I started playing the drums. OK, that’s a bit of a romanticisation. What I actually mean is I started playing the drum part on the video game Rock Band. Still, they reckon that if you can master the songs on "expert" level, you could sit down at a real drum kit, make the same movements and you’d be actually playing that song. I’m sure that if real drum kits only had four things to hit, all of them being the same shape and each one always making the right sound at the correct volume no matter where or how hard you hit it, and with a couple of them doubling up as tom-toms and cymbals, then this would be true. However, for someone of my limited co-ordination – and having never picked up a pair of drumsticks in my life before - I consider it something of an achievement that I got my first 100% score on hard level today. The photo is horrible, sorry – I only had my phone to hand. 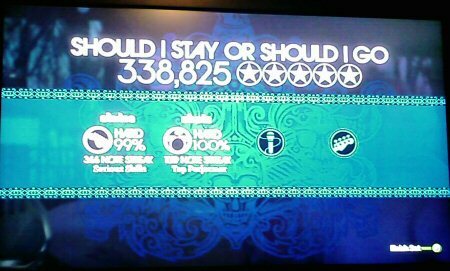 It just about shows Claire getting 99% on guitar (apparently just one silly mistake away from perfection, she’s done it 100% before) and my massive 100% with a 1016 note streak, both playing hard level on The Clash’s "Should I Stay or Should I Go". I will almost certainly make the effort to fetch a proper camera the first time we both nail it at the same time. That has happened before, but only on medium difficulty (Pixies "Wave of Mutilation" is pretty straightforward for both parts) and we’ve already gained as many virtual fans in the "world tour" mode as we can without moving up to hard level. I’m not unhappy at acing The Clash, but I actually wanted my first 100% song to be Weezer’s "Buddy Holly" so I had an excuse to embed that video rather than just link to it. Or Nine Inch Nails, because that sounds like it should be a lot harder than it actually is. I’ve been very close on both. Or for bonus cheese points, it could have been The B-52s "Roam". I don’t care what you think, it’s great fun to play and I already had a 1600+ note streak and came within one brain fart of doing it perfectly! So, for the next step in my drumming career, I need to decide which route to take. Should I aspire to be as great as this guy, who owns every song on expert level, and has made many top quality videos to prove it? Yes, he has socks strapped to the drum pads. This is strangely appealing. The only modification I have is a set of Hard Rock logo drumsticks painted with a flame pattern. Or, should I paint my face blue and start hitting other things? How would that be for a career change? There’s already an official "stage kit" with lights and a smoke machine due out this summer, but I haven’t heard anything about a paint drumming kit yet. It’s inevitable though, I’m sure.